Do y’all have a least favorite meal? I know most people have a favorite meal. Mine is breakfast. I’d eat it 3 times a day (Actually I sometimes do.) My husband’s is probably dessert. But a least favorite? I know mine for sure. It’s lunch. Lunch is just so…meh. I don’t really get excited about it because my lunch is usually so predictable. Toss whatever leftovers are in the refrigerator on top of whatever green things are in the refrigerator before heading out the door. Then noon rolls around and I end up feeling, well, sad, about my #SadDeskLunch. But lately I’ve been trying to plan ahead and prepare lunches that I can get excited to eat (like this Brown Rice Sushi Bowl) so I don’t feel like lunch was a meal wasted on food that’s just meh. That’s why this month’s Recipe ReDux theme is so great. 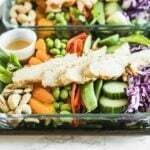 It’s all about lunch this month, and it’s helped me to get a little more creative so I can use my mid-day meal as an opportunity to not only get lots of different nutrients, but to also get excited about eating something #NotSad. 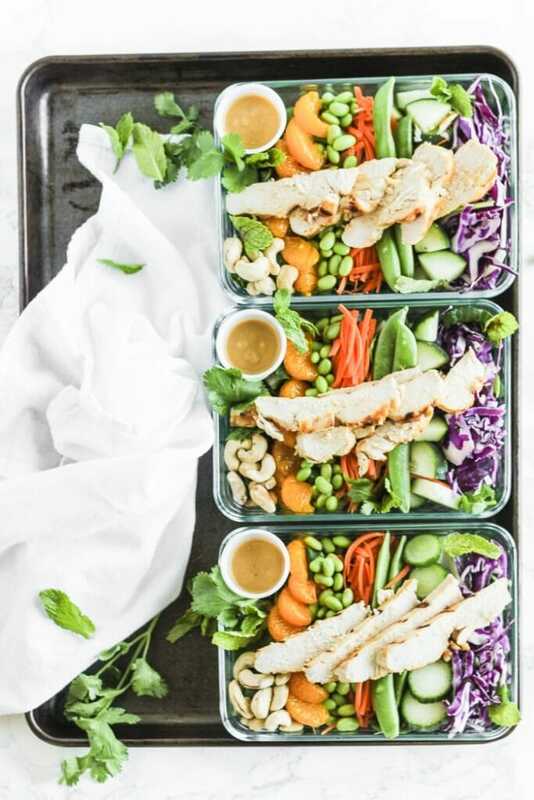 So my lunch recipe that I’m sharing with you today is these healthy but super delicious meal prep Asian miso chicken salad bowls. If this sounds familiar, it’s because I’ve already posted my Miso Chicken. (What, you didn’t think I was going to do lunch completely free of leftovers, did you?) This way, it’s easy to prep an extra chicken breast when you cook miso chicken for dinner and make a fabulous lunch for the next day! 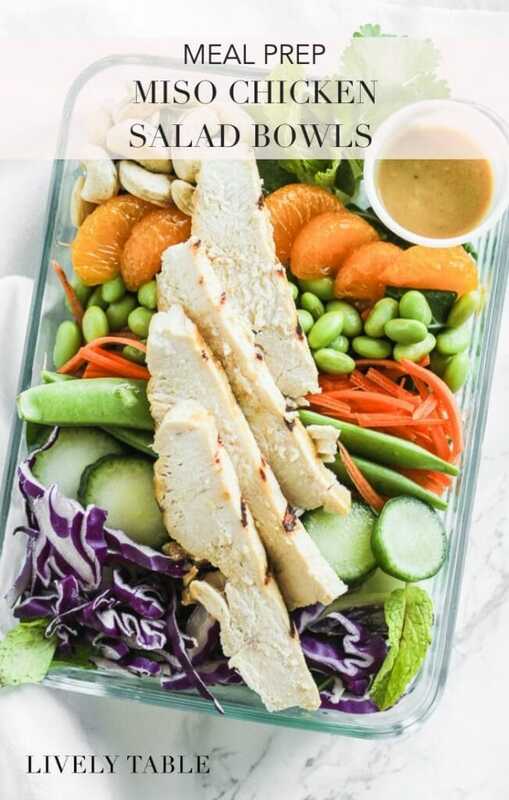 All you have to do is chop some veggies, put them all in a container, and add the cooled chicken. Then top with some fun toppings. You can’t forget the toppings. I love adding nuts, and edamame for some extra healthy fat and protein in addition to the chicken. Plus the salad dressing is extra-delicious. You could even get really fancy and add sesame seeds or some crispy chow mein noodles if you want. 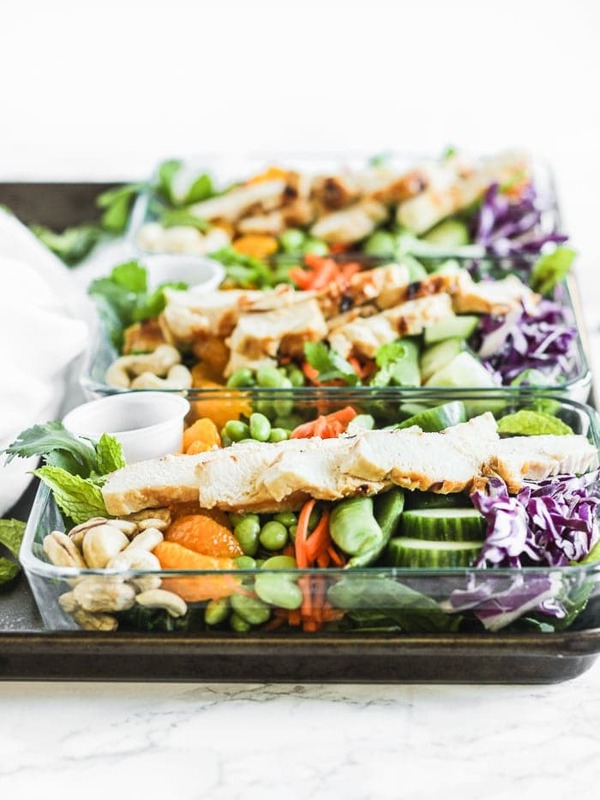 All of the bright colors and flavors in these meal prep Asian miso chicken salad bowls are oh-so tasty and provide tons of healthy nutrients, which, hello, is the purpose of lunch – to keep you going through the day. And you will definitely feel happier once you open your Pyrex and compare your happy lunch to your neighbor’s leftover cold pizza. #Winning. 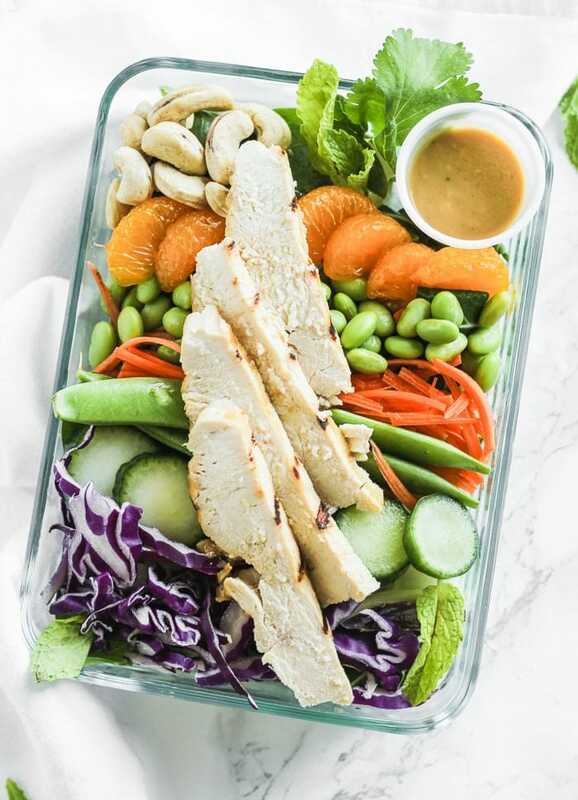 An Asian-inspired salad with Miso Chicken and lots of healthy toppings is a delicious, satisfying, gluten- and dairy-free lunch that is easy to prep ahead for the next day! Divide greens between 3 meal prep containers. Divide remaining salad ingredients containers. Mix dressing ingredients. Add to small dressing containers. Cover and refrigerate until ready to eat. Pour dressing over salads before eating. You may also omit the cucumbers and heat up bowls before serving. I like to add everything, including the dressing, to a nonstick skillet and sauté for a few minutes until warmed. I’m totally with you on the leftovers over greens for lunch and needing to spice it up. 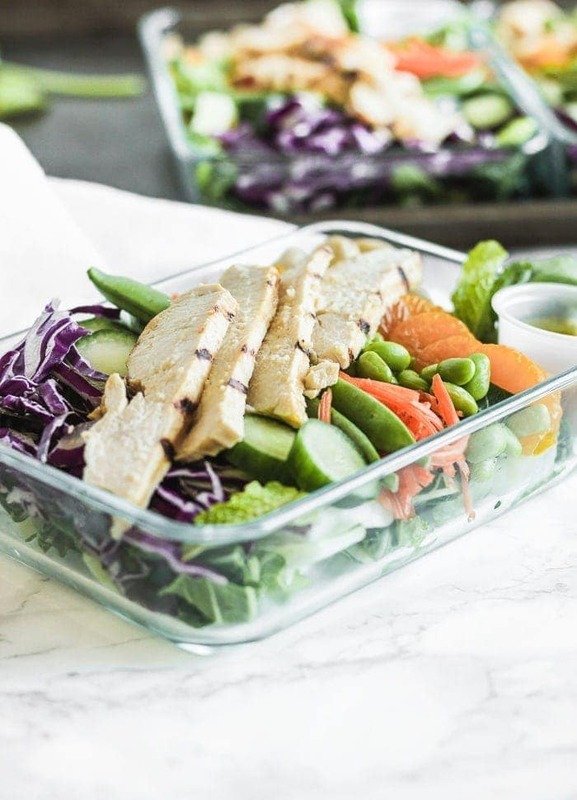 This salad looks like the perfect way to do just that! Yum! This sounds delicious! I love your photography, too. Thanks Sarah! I hope it makes your lunch time a little less meh!